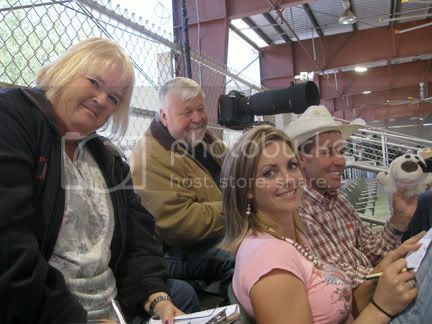 Nancy Crawford-Hall and her husband Phil Hall of Holy Cow Performance Horses are pictured here with their trainer Jake Telford and his wife Jessie Telford at the NRCHA’s Hackamore Classic in Paso Robles. Jake Telford rode three horses entered in the show for Holy Cow Performance Horses: Sheza Roo, Kiss My Shiny Lips, and Shady Lil Starlight. Top honors went to Jake Telford and Shady Lil Starlight who won the Open Bridle Sweepstakes beating the reigning NRCHA World’s Greatest Horseman Champions Russell Dilday and Topsails Rien Maker–who took Reserve honors. A big congratulations goes out to Holy Cow Performance Horses and Jake Telford for this outstanding performance and accomplishment. 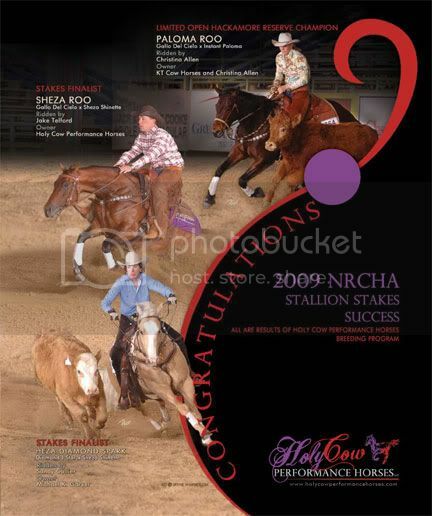 Holy Cow Performance Horses LLC are the owners of stallions CD Survivor and Shady Lil Starlight as well the home of Sheza Shinette, the 3rd highest money-earning mare sired by Shining Spark. Their beautiful breeding facility (located at San Lucas Ranch in Santa Ynez) has been a labor of love–officially opening in 1999. This is their most recent ad highlighting their success earlier this year at the Stallion Stakes. Ad Design by Jayne Wayne Design.